What you put in your body on a daily basis affects SO much more than you think. Food has the power to make you feel energized and happy, or tired and low. Free Bonus: Download the six tips that we practice at Officevibe to master work-life balance. Don’t let their size fool you. Good things come in small packages, and these little guys are a total powerhouse. In fact, Aztec warriors used to eat this superfood for a surge of energy and endurance. And, they’re easy to include in just about anything. I add them to my smoothies or sprinkle a handful onto my oatmeal, salad or soup. Why not keep a bag in the kitchen for the office to share? It’s a great way to raise energy within the workplace and it promotes a collective movement towards healthy living. At Officevibe, we have baskets of communal fruit lined up against the kitchen wall, which says on behalf of the company “we care about you and your health”. These are some of my favourite easy chia seed recipes by Clean The Eating Goddess. Try soaking the seeds before eating. When you do this, you’re basically ‘sprouting’ them, which means that they become a bit easier to digest and a lot more nutritious. The only thing to look out for is that they don’t get stuck in your teeth, but it’s a small price to pay for such quick and easy health benefits. What other blue fruit is there? Blueberries are a serious, serious superfood that should make their way in your grocery basket each and every time. In addition to the new and exciting evidence that blueberries support brain health and memory, they are extremely high in antioxidants, which are what help prevent disease by attacking free radicals. Even just a half a cup a day will make a difference in your overall health, boosting your productivity at the office so you have more focused and efficient days. Frozen berries retain all their nutrients. Buy a bag to keep in the freezer and add a handful to your morning smoothies. I keep them at my desk and munch on them during the day when I feel the need to snack on something. It’s natural to want to nibble while you work. Why? Because the act of eating offers a moment of reprieve from focus, it’s pleasurable and our brain needs nourishment to maintain concentration. It’s so easy to grab a bag of chips or a donut, but these heavy foods will decrease your mood and your ability to function. Our bodies use up a lot of energy trying to digest junk food. Have you ever had a burger and fries or a slice of pizza and then tried to get back to work? You may have satisfied a momentary craving but afterward, I’m pretty sure you just need a nap. The Science Behind the 3 p.m. Snack Slump is a great article on the real reasons behind why we feel the need to snack. Researchers in the study found that the strength of the relationship between stress and hunger varies throughout the day, peaking in the afternoon on weekdays and in the evening on weekends, which could help explain why that craving for a giant cookie usually strikes during a frantic afternoon at work. The great thing about choosing walnuts as an afternoon snack – in addition to supporting brain health and concentration (due to their high content of Omega-3 fatty acids) – is that they’re filling but not too high in calories like many other nuts, so you can enjoy them guilt free. Nearly 90% of the walnut’s antioxidants come from the skin, so resist peeling! Hemp seeds, like Chia seeds, are super easy to add to your morning routine. Just plop a tablespoon into your smoothie (created by Deliciously Ella) or sprinkle some onto your yogurt, oatmeal, or my favourite, on top of sprouted whole grain toast with almond butter. Yum. It’s a great way to pack nutrition and energy into every meal. This plant-based powerhouse is famous for having all 10 amino acids (the building blocks of protein and muscle tissue) and a super high protein and Omega count. This is another easy thing to keep at the office for employees to share. Just leave a bag in the fridge for everyone to add to their breakfast or lunch. It also prompts people to leave their desks and walk around which is very important. Taking a break every now and then to stretch your legs helps keep up the focus. Providing employees with these resources will create a culture of appreciation and all around good vibes. According to Perspectives in Public Health, workplace nutrition initiatives are estimated to increase productivity by at least 2 percent. This is a call to action to work with your team to come up with ways to make healthy eating more accessible during the day. This comfort food has excellent health benefits. Aside from making you happy, dark chocolate is filled with antioxidants. I leave a bar of 70% cocoa dark chocolate (try not to go lower than that) in the fridge at work and around 4 p.m. when my hunger and “need for sweet” kicks in, I have 2-3 squares, totally guilt free. There’s caffeine in chocolate, so it will give you a little boost without the jitters of having had too much coffee. When picking your chocolate, always look for a high cacao content and a low sugar content, but remember that cocoa can be bitter on its own. It feels like a total indulgence but really you’re doing a good thing for your brain and your body. 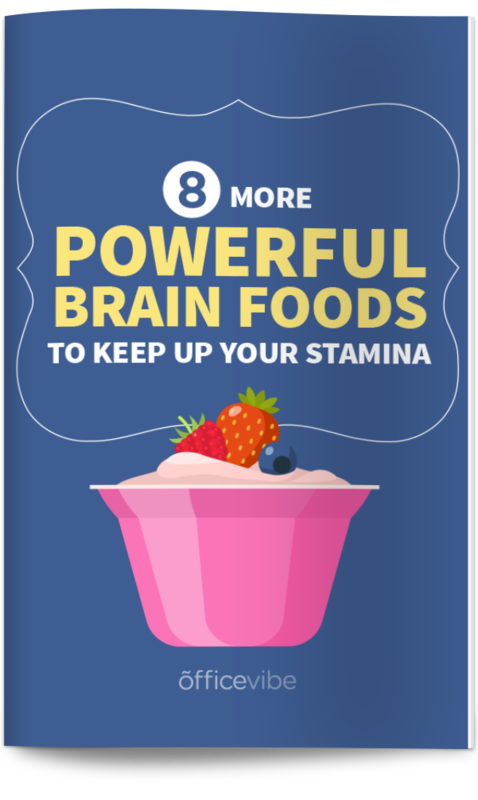 Its minerals like potassium, zinc, selenium and iron – amazingly, over 60% percent of the daily recommended value – and the high content of flavanols help blood and oxygen reach the brain to boost concentration and memory. This trendy superfood has taken the stage on menus and Instagram feeds. People have had mixed feelings about avocado over the years because technically they’re a high-fat food, however, monounsaturated fat is the good kind heart-healthy of fat. I wouldn’t suggest eating three a day, in fact, I think half an avocado will do. Interestingly, avocados contain even more potassium than bananas, and this is important because typically, people don’t get enough potassium in their diets. Potassium helps lower blood pressure. Sprouted bread with one-half mashed avocado, sea salt, pepper olive oil, a sprinkling of chili flakes and lemon juice. It’s an easy, filling, healthy and focus-inducing lunch. When you have more time, try any of these 5 delicious avocado toast recipes to hit the spot. When you’re making guacamole and want to avoid the avocado from browning quickly, keep the pit in the bowl and squeeze some lemon juice on top. The truth about peanuts is that they are not actually from the nut family. The peanut, Native to South America is a legume, which just so happens to taste like a nut. The number one thing to remember is that when shopping for peanut butter, avoid brands that have added sugar – those are more junk food than anything. Instead, look for products in the natural food section. The shorter the ingredient list the better. Naturally, peanuts are filled with protein, fiber, potassium, and the good kind of monounsaturated fats that promote healthy heart and brain function. One of my favourite powerhouse breakfasts is sprouted whole grain toast – Ezekiel bread is my go to – smeared with peanut butter, a chopped banana, and hemp seeds. The rich protein content will help keep you full and energized all morning. But, if you don’t have the time to prep this because you’re not really a morning person just add a spoonful your smoothie, or, just snack on a spoonful. It’s delicious, and the high-calorie count will help keep up your energy. But the truth is that you probably aren’t drinking enough water during the day. Our bodies are made up of 80% water, and our brain is made up over 70% water, so when we are dehydrated, we’re not at all functioning to our full capacity. Think of it like a plant. When a plant doesn’t get enough water, it wilts. We work the same way. When we don’t keep our bodies hydrated, we don’t function properly. Water should be the first thing you put in your body every morning to get everything flowing. In the morning, I have warm water with half a lemon. This helps flush out toxins and since lemon is an alkaline fruit, it helps to reduce acidity in the body, which causes disease. Afterward, I have water with apple cider vinegar, which is delicious and aids with digestion by increasing stomach acid, which helps break down food. Later in the day when my energy starts to feel a bit lower, I’ll add some chlorophyll to my water. It’s filled with antioxidants and helps fight off candida build up which causes fatigue. Provide your employees with reusable Nalgenes so they can refill them throughout the day without waiting for clean dishes. You can even get the company name printed on it so it acts as ‘swag’ – which everyone loves. It can make the water-drinking process a little more fun and incentivizing. Our parents used to pack cut up carrots in our lunchboxes during our elementary school days and the truth is that not much has changed; we should still be bringing carrots to enjoy with our lunch or to have as a snack. For the brain – carrots contain a flavonoid that reduces inflammation that can lead to cognitive decline. They are also high in carbohydrates, which is important for brain function. Wash your carrots well before chopping them but don’t peel off the skin! There are tons of nutrients in it that you don’t want to remove. And, avoid buying the baby carrots that come in plastic bags. There has been an ongoing debate about their potential health risks, so it’s best to steer clear. Every Sunday evening, I prepare a few hard-boiled eggs for the week so that when I start to get busy or don’t have time to scramble them up for breakfast, I don’t have an excuse. Eggs are a must in your diet. They are among best sources of choline out there, an extremely important nutrient for the brain and cognitive health that most of us do not get enough of. How To: Eat the yolk! There are tons of nutrients in there, and…yum. Notice the deep red tone. This means that they’re exceptionally rich in antioxidants, so you’ll want to include them in your diet. I usually add them to my salad (my latest: beets, feta and mint with a yogurt, white wine vinegar and cumin dressing) but they are also delicious as chips: thinly sliced, baked in the oven and strewn with sea salt. High in nitrates, they help open up oxygen flow to the brain so they are a true brain-loving food. Coconut oil has made it’s way to the top of the popular foods list in the past few years mostly because it’s good for just about anything. I even add it to coffee in place of milk or cream. Medium Chain Triglycerides break down into ketones which the brain uses as fuel. Just make sure that the oil you buy is raw, organic coconut oil. Check out this guide to everything coconut by Epicurious. Try oil pulling, an ancient Ayurvedic technique that pulls toxins from the body. Getting out all the bad stuff helps you feel better, which will help you focus better throughout the day. How do you think you can bring health into the workplace?